"Anyone who has heard the legends surrounding German conductor Hans Knappertsbusch knows that 'Kna' favored under-rehearsed, spontaneous performances and slow tempi. Well, yes, and those idiosyncrasies mark his recordings as well as 'live' radio broadcasts that have survived. His 1961 Westminster studio recording of Beethoven's FIDELIO has always been reckoned something of a failure for these very reasons, but I think it's time for a reappraisal. Sure, Kna's tempos are often times slower than the norm, but this just underscores how attentive he is to giving his singers space to breathe (as well as carefully underlining Beethoven's harmonic structure). And what singers! Every member of this cast is world-class, headed up by the remarkable Sena Jurinac. Vocally secure and possessing an incomparably creamy legato, Jurinac was a true dramatic soprano and a memorable singing actress. Too few of her stage performances are available today and this, along with a wonderful Octavian on the Decca Erich Kleiber ROSENKAVALIER, showcases Jurinac at her best. 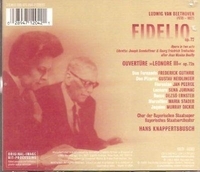 Singing Florestan to Jurinac's Fidelio/Leonore is the American tenor Jan Peerce. Peerce was approaching the end of his operatic career when he made this recording and his voice at times sounds a bit worn. But that quality fits the role of the falsely imprisoned Florestan to perfection in a performance otherwise notable for a truly remarkable intelligence and sense of humanity. (It's amusing to recall that, about 15 years earlier, Peerce recorded the same role with Toscanini for RCA. Thus, Peerce has the distinction of working for both the fastest and the slowest Fidelio conductors on record!). The evil jailer Pizarro is the fabulously memorable Gustav Neidlinger, while the smaller roles are filled by such stalwarts as Deszo Ernster, Maria Stader and Murray Dickie. What we wouldn't give to hear such a cast today! But Knappertsbusch is the real star of this production and he has many thought-provoking things to say about Beethoven's only opera. Note that the performance includes the Leonore III overture interposed before the final scene of Act II. That's the way many conductors performed FIDELIO fifty and a hundred years ago after Gustav Mahler introduced the trick around the turn of the last century. People still debate whether it works as a musical device but, in Kna's hands, the performance of the interpolated overture helps transform a story about particular people living in a particular place and time into a universal epic of human love and freedom. Very moving." "Hans Knappertsbusch was one of the most renowned and beloved conductors of the German Romantic repertoire in the middle twentieth century. He spent several summers as an assistant to director Siegfried Wagner and conductor Hans Richter at the Bayreuth Festival and took part in the Netherlands Wagner Festivals in 1913 and 1914. After the end of World War I Knappertsbusch worked in Dessau and Leipzig, and in 1922 he was asked to succeed Bruno Walter as music director of the Munich Opera. Knappertsbusch's personality was easygoing; he was notably free of the restlessness and undue ambition that often attended a rising career such as his. He was content mainly to stay in Munich, with the result that he never became as well-known as many of his colleagues. In any case, Munich fully appreciated Knappertsbusch's talents, and he was named conductor for life. However, he refused several demands made by the Nazis and was fired from his lifetime post in 1936. He conducted a memorable SALOME in Covent Garden in 1936 and 1937, and made some guest appearances elsewhere in Germany, but was content to maintain a low profile during the Nazi regime. He left Germany after the Munich debacle, settling in Vienna where he frequently conducted the Philharmonic and the Vienna State Opera. Knappertsbusch's career was again affected by the Nazis when Germany took over Austria over in 1938, but he was mostly able to steer clear of trouble. Knappertsbusch gained a reputation for broad, magisterial performances of Bruckner, and more and more seemed to emerge as the representative of the traditional style of unhurried Wagner performances. He was famous for disliking rehearsals, often cutting them short; his orchestral players maintained that this was not the result of laziness, but of complete security in his interpretation and trust of the players. His performances were therefore not rigidly preconceived, but instead had a remarkable freshness and spontaneity. When the Bayreuth Festival reopened in 1951, Knappertsbusch worked closely with Wieland Wagner on orchestral matters (though the conductor was known to dislike the director's spare, revolutionary stage productions). Perhaps Knappertsbusch's most notable recording is his stereo account of Wagner's PARSIFAL from the Bayreuth stage."